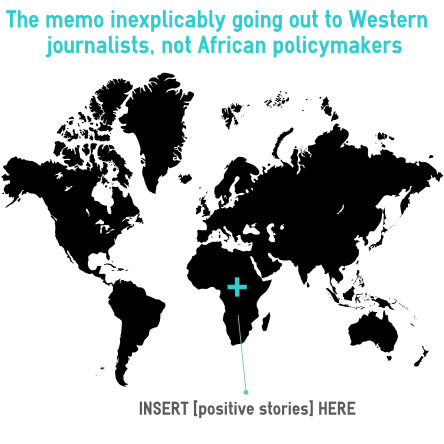 DiA writer Rowan Emslie considers the downsides to reporting positive stories from Africa. A fair amount of hand-wringing has been going on lately regarding a narrative in aid/development that has been pretty prevalent for at least as long as I’ve been interested in it (around 5 years) – ‘telling positive stories about [Africa/Sub-saharan Africa/the developing world etc]’. 1) The aid industry has been getting advertising makeovers for, oh…. FORTY YEARS. It’s time to take off the makeup. Can we stop “advertising” and just “tell the truth” already? This was referenced in the discussion about this article on Aidsource as absolutely not being a new idea. I’d definitely have to agree with that one – since starting my first NGO comms job about 10 months ago I have lost count of the amount of times I have heard speakers at events or read articles by influential comms types telling us that ‘success stories’ are the main way forward. While I think there is a lot of use for this approach – the advocacy done by ONE on supporting better aid budgets for example – it is, first and foremost, an advocacy tool and one that might go some way to explaining how NGOs distort the issuesand, in the long run, disappoint their public. Ok, but isn’t the focused narrative upon success stories part of a wider narrative of redirecting aid to the most effective programmes? Consider Andrew Mitchell’s restructuring of DfID/re-assessment of countries Britain gives aid to based on the stated obejective of making sure the best and most effective programmes receive the best funding. There is a general move towards aid based on success of the programme rather than need – emphasising sucess it isn’t necessarily the most benevolent way of using or discussing aid, but it’s the one that best fits into the current narrative.